We do not have a training scheduled at this time. Please contact Cathy Blood, blood@wsu.edu, to be placed on our email distribution list for the training. Extrusion is a very common processing technology used in the food industry to produce direct expanded snack foods, cereals, and pet foods, among other products. Extruded products are typically made by utilizing a raw material, often flour, and subjecting it to high temperatures while also creating a high shear and high pressure environment using rotating screws. This introductory course will provide information about the extrusion processing systems, extruder parts, basic heat and mass transfer, extruder screws and dies, food ingredient functionality and food product development with extrusion. The course will provide practical examples of product development with extrusion using ingredients. Extrusion is a very widely used technology in the food industry. Some of the common food products made with extrusion technology include snacks, breakfast cereals, flat breads, bread crumbs, pellet products, textured vegetable proteins and many others. It is a complex process with multiple inputs variables. Extrusion can be viewed as a reactor with a short residence time and with numerous options to control the energy inputs. The food ingredients in extrusion undergo physico-chemical changes as they are subjected to mechanical shear and heat. These physico-chemical changes transform them into the products with different eating characteristics. Physico-chemical changes in various food ingredients during extrusion processing and their effects on the extruded products. Fundamental aspects of extrusion processing. Waxy and Partial Waxy Wheats processing. 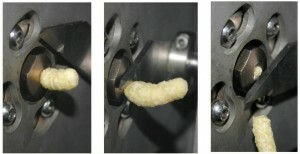 New technique for evaluating the cross-sectional density profiles of extruded foods. Super Critical and High Pressure CO2 extrusion processing. Course starts promptly at 8 am to 5 pm each day. Check-in the first day begins at 7:30 am the first day. This fee covers course materials, refreshments, and lunch for both days. Class size is limited to 24 people. If you would like an email notification for all our trainings, please email Cathy Blood to join our food processing and food safety email distribution list. Continuing Education Units (CEU’s) credits will be available for this course. A short test will be given at the end of the course, which the students will have to score a minimum of 70% to receive the CEU’s credit. Cancellations will be accepted until 10 days to the course, and the registration fee, less $75 will be refunded. After that time, no refunds will be made for cancellations. Substitutions will be allowed at any time. For additional information please contact our office at 509-335-2845, blood@wsu.edu. Your registration is not final until full payment is received. We accept Visa, MasterCard, and personal checks for payments. Please send check payments prior to beginning of the course. Course materials will only be available for paid attendees. For questions regarding registration, please contact Cathy Blood, blood@wsu.edu or 509-335-284.